In a time when motorcycle technology has seen virtually limitless advances, headlights have remained a largely anemic component. Adventure Riders are at the forefront of the need for visibility, as the roads less travelled often have little to no lighting infrastructure. As Accessory Lights have made their way into the Motorcycling world, we are faced with more options and a drop in overall pricing. This is most prevalent in the emergence of LED technology, which provides superb visible performance in a small, durable, affordable package. 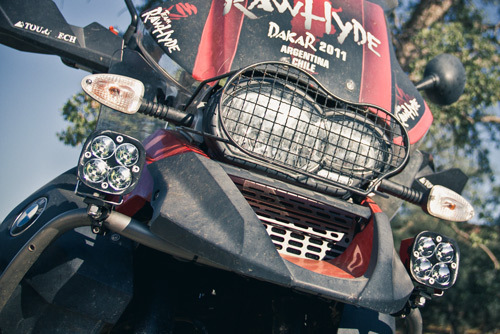 Regardless of which Adventure motorcycle you choose to ride, there is a lighting package that will work for you. Most motorcycles’ stock headlights leave much to be desired in terms of identifying more detail when riding off-road either at dusk, dawn, or night. A rut in the road or wildlife in the brush can easy be missed by the eye in low light due to a lack of highlight and shadow. Contrast, intensity, and spread are some keys factors to consider. Also to be considered is price, power draw, size, and durability. Often auxilary lights are mounted in areas that leave them vulnerable when the bike tips on it’s side. Visibility may be great, but If the lights are expensive, bulky, and prone to breakage; your one time solution can become an irritating recurring cost. Lights by Baja Designs and Clearwater Lights will offer you the best in brightness, durability and price. Compare the two and select the one that suits your taste.